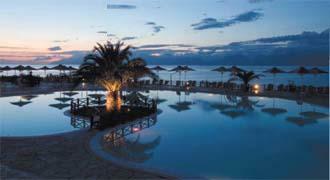 Situated on Corfu’s sun-kissed northern shore, the Mareblue Beach Resort offers luxury and seclusion. 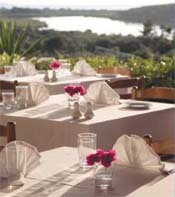 Among the best resorts on Corfu, it is tucked away in acres of lush vegetation next to a pristine, white-sand lagoon. It is located between Acharavi and Kassiopi, near the village of St. Spyridon, at 40 kilometers from Corfu Town. Appointed with modern and comfortable furnishings, the 350 spacious guestrooms feature all contemporary amenities, including air-conditioning, mini fridges, safe deposit boxes, Satellite TV, direct-dial phone, Wi-Fi, TV music channel, hairdryer, coffee/tea appliances, bathroom w/bathtub, bath accessories and balcony or terrace opening to magnificent sea or garden views. Holidays get tastier with scrumptious variety menu and Mediterranean dishes prepared by experienced chefs. The comfortable living room, the modern central restaurant, the relaxing bars, the romantic “Ostrako” Restaurant with direct sea views and the pool-side “Zephyros” Restaurant, the high quality services and hospitable staff ensure the ideal conditions for the holidays you deserve. There is a high range of facilities and services available to guests, including large pools with complimentary sun beds and umbrellas, children’s pool, playground, supervised mini club and disco, electronic games, billiards, ping pong, badminton, aerobics, laundry-dry cleaning service and much more. From tennis to basketball and football, beach volley to water polo, night entertainment, shows, games and competitions, the Mareblue Beach Hotel is the perfect destination for your summer holiday adventure. A six-day soft animation program for adults and children, videos with cartoons and children’s films offer unforgettable moments of first-class holidays and relaxation.